Perhaps you have come across the word palliative care and didn’t take much notice of it until somebody – like a loved one – brought it up to you. Just like you, there are a lot of people who really do not have the slightest idea of what palliative care is and what it is for until the time came when they need it themselves. We don’t mean to sound terrifying but palliative care is something you really would not want to need for yourself or for your loved ones. Palliative care, as defined by the website http://palliativedoctors.org/, is care given to relieve suffering and improve the quality of life for people at any age and at any stage in a serious illness, whether such illness is curable, chronic, or life-threatening. Oftentimes, people compare palliative care to curative care. The two are actually not opposing care methods. They are entirely two different things which may be used to complement the other. While palliative care is given to relieve pain and symptoms, curative care is given to cure and heal the disease which brings forth the pain or symptoms. Curative medicine is the way to go for conditions and illnesses which are still remediable or medicable. But for illnesses which are beyond treatment, the best available option is palliative care which is geared to providing relief amidst the disease. There are times when a person who is suffering from a remediable disease chooses to get palliative care at the same time until the point he is healed to avoid enduring the pain brought about by his illness. There are also a lot of people who mix up palliative care with hospice care. We cannot really blame them because both are very much related to each other. Palliative care is individualized care given to a person who needs pain relief for diseases whether curable or not. Hospice care, on the other hand, is a type of palliative care which is given to patients suffering from terminal illness and are left with a few months to live. Palliative care is needed by individuals who want an alternative to suffering from their illnesses. It is an available option for people to live comfortable, dignified, and un-crippled lives even with the presence of symptoms from their conditions. Palliative care is not exclusive to those who are suffering from terminal illnesses but to all those who are burdened with pain and would want to put an end to it in the safest and most effective medical way possible. Palliative care is being administered by a group of medical professionals often termed as an interdisciplinary team. This team provides multi-faceted assistance to the individual who needs support in the face of a painful disease. The team is usually composed of a doctor who specializes in palliative medicine, a nurse, a medical social worker, a volunteer, a dietitian, and a pharmacist. What to do when you know you need palliative care? There are times when your doctor will tell you to get palliative care and recommend a care provider. But getting palliative care is a personal choice that you and your family can make for you to get back your “life” amidst your condition. If you feel that now is the time to get palliative care and that you want to have it at your home, there are companies and agencies which provide private, affordable home health care with a guarantee of one-on-one personal care. 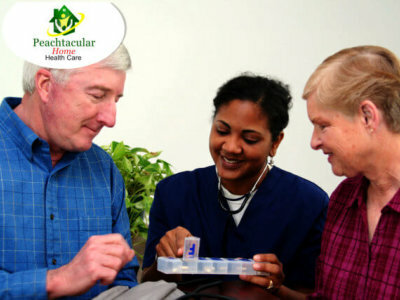 Peachtacular Home Health Care, a provider of home health care in Metro Vancouver can assist you in your need. We are here to provide you with excellent palliative care at home so you no longer have to spend your days in agony and discomfort. You can call us today to schedule an appointment. Palliative care is a branch of care that we need not be scared about. It is something we need to know about so if we ever need it someday, we would know better than be left suffering in the dark. We know how it’s feel to see your love one in a terminal stages. Let us help you to share the moment of your pain to give comfort and best quality of care to your love one deserve. We guarantee you Peachtacular Home Health Care you have no worries our PSW has an experience and knowledgeable. We provide the higher quality, safety and dignity and treat client with compassionate care to control pain and symptoms of illness until the end of life.